Chennai is flooded. All those visuals of the city, on TV news channels, reminded my Dad of similar floods in Patna in the year 1975. So, as we sipped our morning tea today, he took me on a walk down his memory lane. 1975 was the year my Mom and Dad got married to each other. Unfortunately (for my Dad! 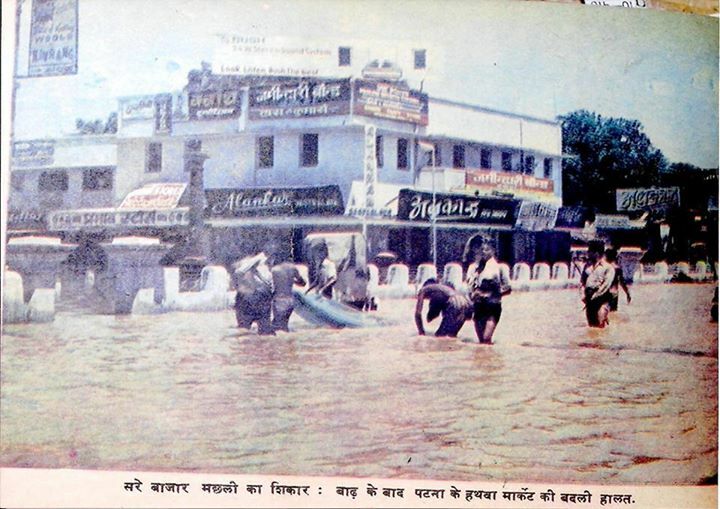 ), when Patna was hit by those heavy rains, Mom was not in town. She'd been visiting her parents that time. She was supposed to return the night before the city got flooded, but Dad didn't find her on the train when he went to pick her up from the railway station. Apparently, my nanaji (Mom's Dad) chickened out at the very last minute and didn't send her off! Dad is still very sore on that point [grins], but aside from that, he thinks of the whole experience as "the adventure of a lifetime"! Flooded Boring Road Chowraha, Patna in 1975. This is where I used to stay before I moved to Jaipur! 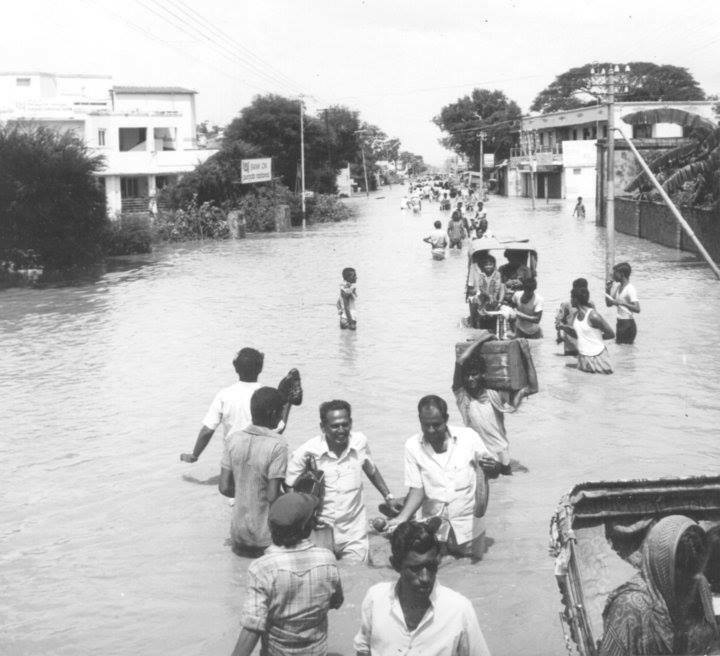 The Patna floods of 1975 were different from the current Chennai floods in that they were not entirely "nature-made". 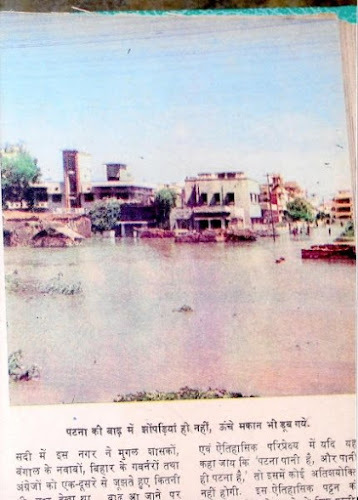 As Dad recalls, the heavy rainfall had caused the water-levels in the Sone river to rise above safe limits, but that flood was mostly the result of dam waters being diverted into certain parts of the town, in order to keep the Danapur cantonment from getting flooded (because that would have led to serious military losses, destroying millions of dollars worth of artillery) and also to ensure that the excess water exited as quickly as possible into the Ganga river. So loudspeaker announcements had given prior warning to people in most of the affected areas. Dad doesn't remember hearing any such announcements though. A family acquaintance, who lived in some other part of the city, tipped off my Dad's family about the flood warnings, before the phone lines went dead. And my grandfather (Dad's father) took immediate action. First thing he did was to get the 200 liter drum filled with clean drinking water. This one action alone saved them from a lot of severe hardships that other families had to face back then! They started emptying all the cupboards and almirahs too then, starting from the bottom shelves first. By the time, they got to the top shelves, the water-levels had risen up to their waist. Within another few hours, the entire ground floor had got submerged under water. Dad's elder brother (and wife) had refused to empty their cupboards. So, by the time the water levels went down (several days later), a lot of their stuff got destroyed. Phones lines remained cut for days. They didn't have any TVs and cell phones back then. And with all that water, naturally, the electric supply was cut too. They had no water supply either. So they collected the flood water by hanging out buckets from the balcony, mixed some alum in it, and used that for washing purposes. My grandma's brothers were very well off. (They own a couple of cinema halls in the city.) One of them had rented a boat. He ferried over to Dad's house to ask if any supplies were needed. But even with that boat and all their money, those relatives still ran short of drinking water. Eventually, with no water supply, they were forced to filter and boil the stagnant water from their air coolers, and use that for drinking! In the meantime, back at my Dad's place, the son of their landlord, who also stayed on the first floor and is still a very good family friend, came up with the idea of putting together a makeshift raft by tying a couple of empty plastic drums together. Their resident servant, one Mr. Ram Udit Mehto, used this "raft" to get vegetables from the higher areas of the city that were not flooded. Fortunately for them, their kitchen was on first floor. And they had all that drinking water. So they were able to cook proper meals. Gobhi ke parathe is what Dad remembers most clearly. Long sessions of card games on the terrace is another thing that he vividly remembers. When I asked Dad about rescue and relief operations, he couldn't remember much, except for these helicopters that were dropping packets of bread and gud-chana (jaggery with roasted bengal-gram) on rooftops. Dad recalls that their terrace was strewn over with so many food packets, which they didn't need. They couldn't let it go waste though, particularly in those hard times. So, once again Mr. Ram Udit Mehto was set a-sailing (or wading perhaps) with their ingenious "drum raft", loaded with as many food packets that the humble raft could carry, and sent off to deliver those packets to other families stranded in nearby areas, with no access to direct roof-top deliveries from the helicopters! 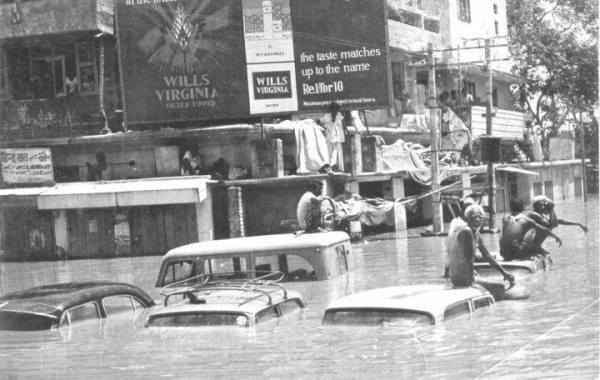 For my Dad's family, the 1975 flood was mostly one extended picnic on the terrace. Yes, they did suffer some losses. And they had to stay upstairs for weeks even after the water-levels went down, because of the dampness and the smell of all the muck and rotting stuff. But it was nothing compared to many other families who couldn't move their belongings to higher ground in time. There was no social media back then, to coordinate relief and rescue operations. In fact, there were no means of communication at all. There weren't even so many vehicles during those days. People were mostly stranded in their own houses, unless they could afford to rent a boat! Some did manage to catch fish from the flood waters though, sitting on their roof-tops or in their balconies! Now that's something you don't get to do too often, do you? Dad is greatly impressed by the way people are using Facebook and Twitter for coordinating local relief operations in Chennai currently. I keep telling him about all the little stories I read on my Facebook timeline, about how people are opening up their homes for strangers, about the various teams set up to give and receive aid (both rescue and relief) in different parts of Chennai, and about how people are sharing information on a real-time basis through social media. Relief teams are able to tell people exactly what is needed at the ground level, and people are donating stuff accordingly (last I read was the request for fully-charged power banks). This direct communication is minimizing wastage very effectively. Pick-up points and times are also being closely coordinated. Rescue teams are reaching exactly where needed, within hours of "SOS calls on social media", when earlier, it would have taken days! All this, because of technology and social media. I bet even Mark Zuckerberg had never imagined *this* use of Facebook when he first conceptualized it! And the real "stars", of this whole chain of events, remain, hands down, the people of India, especially the people of Chennai. While the media, the parliamentarians, and the celebrities keep debating over "Growing Intolerance", the "real India" shows the world once again that it remains as united as ever! whew!! I read your post in one single breath!! I am glad your father's family was ok back then .. Thanks Sunila! Wow! It's a small world! I had no idea you were from Danapur! And you were there at the time of the floods! Just amazing! My Dad's family lived in Patliputra Colony back then. He told me they'd heard about snakes in the water, but they didn't see any 'coz they had no reason to come downstairs once their stuff was moved up. 😊 small world it is yes. I was overjoyed to read ur post. We were in Danapore for 2,yrs Chicky when I was 5 n 6 yrs old. Loved the way you described your Dad's experience. My mother and Mausi have similar amusing tales as almost every year their village would be flooded. Infact they had built upper shelves, close to the ceiling to keep their luggage. She told me how they would sit on the table and cook, while the water would flow beneath. Glad to read so many beautiful stories of humanity from Chennai Flood. Sunila, that must have been some experience! Do you guys have any pics of those floods?